Here is a reminder of that huge beautiful mirror in Ashlee's room. It may look like it cost a million bucks, but you know that's never the case at our house. It was super cheap and easy. This project starts in the bathroom. You read that right the bathroom! These mirrors are in so many homes!! 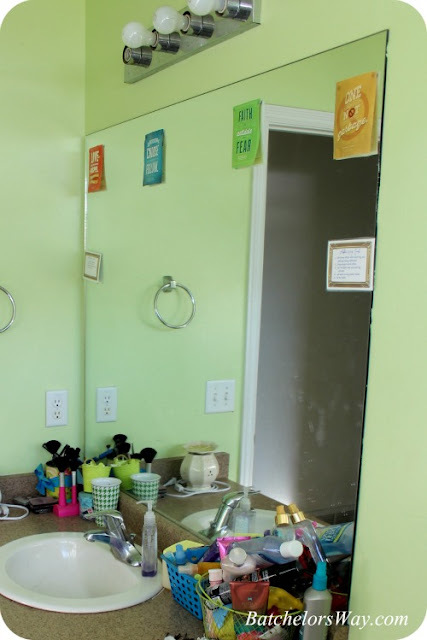 OK, having a big mirror in the bathroom; SUPER IDEA! No storage in the bathroom because the flat mirror takes up the whole wall; BAD IDEA! So I guess you realize we took this baby out of the bathroom. If you follow me on Instagram, you have had a glimpse of what went in it's place. But I'll talk about that later. Today lets talk about where we put this bad boy!! 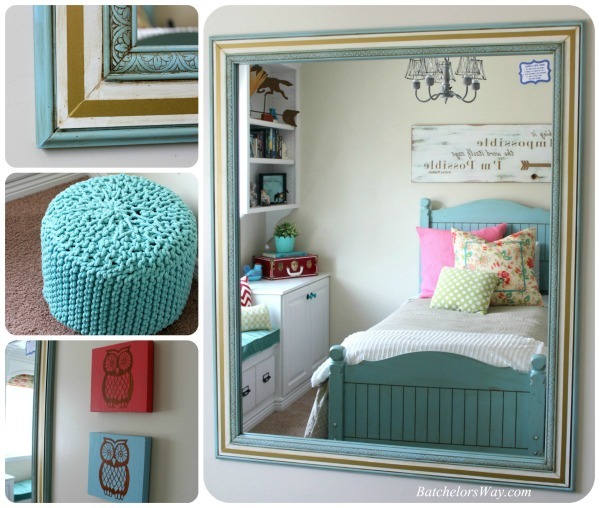 Ashlee was all for a giant mirror in her room!! The only problem was how to install this thing. We didn't want to just glue it to the wall like it was in the bathroom and we couldn't screw it to the the top half of the wall due to what we had installed on the other side of it. So...we devised a double trim system to hold this baby in place. 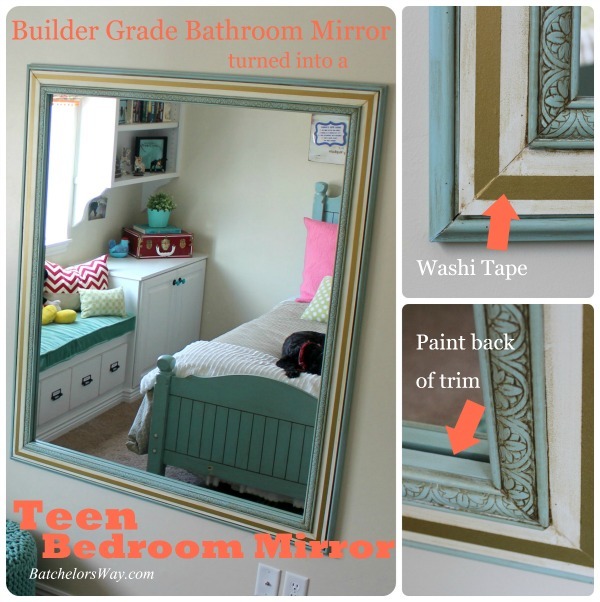 We started by laying the mirror on the garage floor and playing around with trim and boards. I almost had a hart attack when one of my children came out and jumped over the almost 4 foot by 5 foot mirror laying on the ground!!!! They cleared the mirror, but I may have threatened them if they did that again!! Note to self; don't lay mirrors on the floor if Kids are in the house, unless you lock the doors!!! Alright back to the mirror. I started by gluing a painted piece of trim to my favorite MDF slats and then mitering them and cutting them to fit around the mirror. Then I enlisted Les to help install all the pieces. We started with the bottom piece. 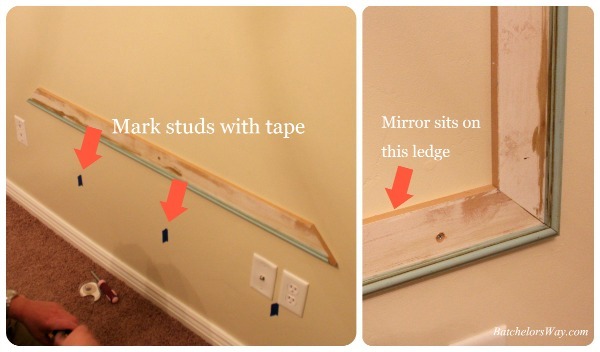 Since we could screw into the bottom half of the wall, and this piece would hold the majority of the mirror's weight We marked the studs with tape and screwed the bottom piece into the studs, making it super strong. The side pieces we just glued and tacked into place with pin nails. You can see the second piece of trim in the photo below. It is also a strip of MDF painted white with a decorative blue trim attached. Once the mirror was in place we glued and nailed this second board up. 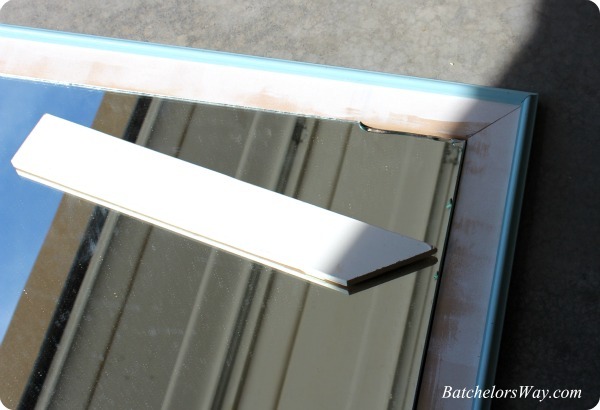 This basically created a lip that covers the edge of the mirror holding it in place. We did have to add some foam board behind the mirror to make it the same thickness as the first board. You don't want a gap or you'll have a loose mirror. I actually painted the pieces before hand and after everything was in place I added a brown glaze. Once installed I found I didn't like the huge white strip. So I went digging through my stuff till I found some gold Washi tape. Yup, that stripe is just tape!! But I like how it looks. Oh and one other thing; we had to paint the back of the trim because you can see it in the reflection of the mirror if you don't; trust me!! The only thing I had to go out and buy was a couple of sticks of pretty trim. Not too bad for a giant 4' x 5' mirror!! That's it for Ashlee's room!